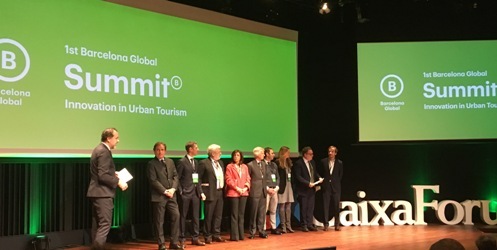 Barcelona Guide Bureau participated in the 1st Barcelona Global Summit: Innovation in urban tourism, celebrated in Caixa Forum on 31st March, 2018. Relevants personalities from public and private institutions offered their opinions and experiences in their respective countries to deal with the problems experienced by cities with a large influx of tourists such a New York, Amsterdam, Cape Town or Miami. The best example to follow for Barcelona. The proposals of the speakers in this search for decongestion, deconcentration, improvement of hospitality and greater use of technology for the benefit of tourism were multiple. Gonzalo Rodés, President of *Barcelona Global, remembered how important is the tourism as a “engine of economic development for Barcelona” and highlighted that “reinforce the relationship between tourism and the city is just able with a strong union of public and private sector”. *Barcelona Global, is a private entity created seven years ago to turn Barcelona into a pole of talent. Among the speakers attending, Carl Weisbrod, NYC Department of City Planning, also stressed the importance of creating partnerships and collaborations between entrepreneurs and governments for the proper functioning of the system and “create new areas of interest” to avoid the congestion of the most popular areas, in theirs case for example, Times Square. A solution that could also be enhanced in Barcelona by having countless museums and areas outside the city of great cultural interest for the visitor. On one hand, Deede Weithorn, Former Commissioner of Miami Beach, explained how Miami changed its image of corruption and party city for a cultural propose. This was achieved by betting on huge cultural events such as the Art Basel that changed the image and the type of tourism that wanted to visit the city. On one hand, Julie-May Ellingson, CEO of Cape Town International Convention Center, said that success in his city was achieved at “reverting the tourism wealth”. And on the other hand, Geerte Udo, Director of Marketing at Amsterdam Marketing, opted for “technology to improve the visitor experience with programs such as the Dutch”, “Goochem” a chat that guides you and gives you cultural options and programs that control illegal rental, scraping, hotline for unwanted visitors and more sanctions to those who do not meet the standard. Actions again just possible with a perfect connection between Goverment, police and citizens. As Fernando Aleu, Chairman at Queen Sofia spanish Institute, New York, said: “Barcelona has been given a cold shower with all the latest events and the important thing is to seek stability and dry up”. The guidelines to follow are the same that other cities did. Now the city just have to execute them. Along with Barcelona Guide Bureau there are other companies and institutions that participated in the congress like Value Retail, Caixabank, Laie, Hotusa, La Sagrada Familia, HI Partners, BGB, Abertis, eDreams…. to ensure the best future for tourism in the city.